Baby Broome is destined to be a girl as far as I can tell. Most of my thoughts center around girl names, nurseries, and clothes! I was visiting Brittney this past weekend and got so excited over some sparkly Valentines Day leggings she had gotten Emmalee. Boys can't wear sparkly leggings and pink moccasins! It must be a girl.. If not though... I know friends who have little boys and they are just as much a joy. Just not a glittery pink joy. 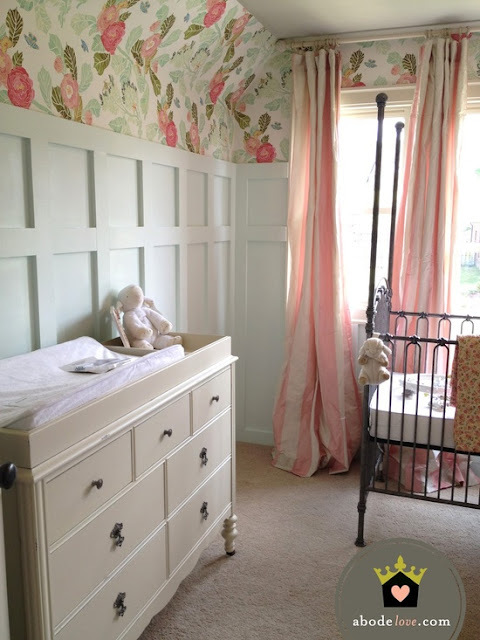 I have narrowed down most of my nursery ideas whether they be a girl or boy. I am not a fan of overly baby nurseries. 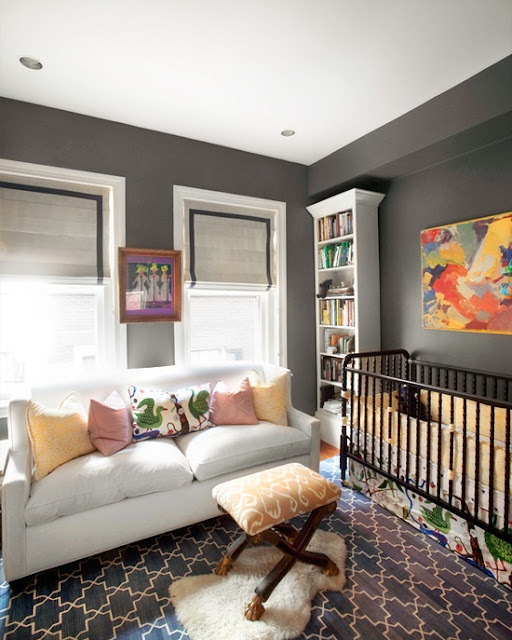 It's still a room where adults have to spend time rocking baby and feeling cozy and our nursery will definitely reflect that. I adore this space. My favorites in this room are the foe built in book shelves and the grey walls. I think shelves are a necessity in a nursery to hold family pictures and books. I want this room to feel like warm welcome to our family. Board and batten I believe this is called and it is perfectly paired with that amazing wallpaper. The curtains and bird mobile(I think?) draw me into this room. A reminder that the statement piece or starting place for the room can come from anything..a painting or some really great fabric. What initially caught my eye in this room is the dresser. I have one identical to it. I think it would be a little small as a changing table though. The board and batten and simplicity of this country esque room are endearing, but I would have to have more color. Mr. Broome continues asking me what color I want the nursery, and I keep telling him, we have to wait to know if it's a boy or a girl. I think I know the color be it boy or girl. I generally have a theme in mind and color palette ready once I know for sure! Can't wait to share when the time comes!